Many of you, no doubt, remember several years ago when we were forming a committee to prevent the Grants from taking any more vacations. If you weren’t a part of us then, you are justifiably wondering why in the world anyone would want to deny Marge and Brent any opportunity to go on one of their visits to yet another exotic spot on the globe. The reason was this: they began returning from their trips battered and in need of hospitalization rather than relaxed and filled with new knowledge about a place some of us can only dream of visiting. Notably, there was the cruise that took them into the icy waters where some turbulence pushed the ship into an iceberg jolting the vessel and causing, among several problems, Marge to be thrown across their cabin onto the floor opposite where she had been standing. This resulted in a severe neck injury ultimately requiring meticulous surgery at Thomas Jefferson Hospital. The accident was not inevitable or brought on by fate. What was inevitable was that some ship, at some time traveling those waters would experience turbulence. You may recall from the limited collection of stories about Jesus that we have available to us today, the account of Jesus and his disciples who went out on a fishing boat and began sailing the normally calm Sea of Galilee. If you recall that much of the story, you also remember that sudden–rare on those waters but inevitable–turbulence threatened to capsize their boat and scared the disciples aboard with Jesus nearly out of their wits. The point of that story, other than intending to showcase Jesus’ command over nature when he calmed the waters, is that turbulence is inevitable in our lives regardless of how long we’ve had nothing but smooth sailing. Tragically, when the turbulence begins for some people it plagues them for the rest of their days; for others, like the disciples in the story to which I refer, the turbulence takes its toll but comes to an end allowing them to live beyond the threat. You might have chosen, I’m glad you didn’t, to be in another church today where the preacher would be giving you a long, enumerated list of things to do to be able to avoid turbulence completely, even though that is nor possible. Undoubtedly, any list would contain two items common to all lists being preached on by such preachers any given Sunday. First, you’d need to believe the right things, which ironically are always exactly what the preacher believes. Second, chances are you’d need to make some sort of financial gift to whatever organization sponsors that preaching. Feel good religion has almost always sold well, but I have to tell you that turbulence is inevitable. So, I’m saying to all of us that turbulence is going to come our way, for shorter or longer periods of time. I quickly add, though, that I am not a doomsayer, and I do not wish to promote paranoia. Preparedness does not have to mean paranoia! The marvelous book of Jonah in Hebrew scripture is a parabolic short story. Those who believe the main point of the book of Jonah is to offer an historical account of a man who was swallowed by a really big fish, but who lived to tell about it, are, I respectfully suggest, missing the point. The book of Jonah is, in its entirety, a metaphor for life as stormy sea for anyone who rebels against God. In fact, life becomes a stormy sea even for those who do not rebel against God, and that is ultimately our concern today; we begin with Jonah and move to a larger picture. I will go ahead and tell you now that the story does not have a happy ending; nor is the ending conclusive. It closes with anger, sadness, and stubbornness. Before we are left with that, we get to know a bit about Jonah at one particular juncture in his life. Jonah was a prophet, but he wanted to be a prophet on his own terms, not on God’s terms. He was successful and comfortable where he was, and then God messed things up for him by calling him to use his considerable communication skills to warn the Ninevites that if they did not heed the reality of God and live accordingly they as a city would fall. Nineveh was a real place; it was the capital of the expanding and powerful Neo-Assyrian Empire and widely recognized as one of the greatest cities in the world. Jonah was accustomed to preaching to people who welcomed his insights and encouragement. He did not enjoy delivering bad news to people he liked, and so he grew very popular by preaching what people wanted to hear yet apparently managing to stay barely within the boundaries of reality. A preacher’s popularity may often lead to blind and unfortunately callous comfort among those who hear her or him. Ministry of any kind is supposed to be an on-your-toes responsibility; complacence is not acceptable. Sometimes, definitely not always, a lengthy ministry loses its edge. It becomes more about placating than about challenging hears to take risks and to take stands. One of my star preaching students asked me to meet her for coffee before class last week. She wanted to talk about some turbulence in the congregation she is serving as pastor. The position as pastor of that congregation in an odd way fell into her lap. She was not actively seeking to serve in that role, in that place, and yet the call came with both urgency and promise so that so she knew deep down she could not decline it. Certainly, she can identify with St. Augustine who claimed that he was ordained to the priesthood against his will; he writes about a congregation where he preached in North Africa, and they liked him so much they forced him into the ministry. That’s an odd tale to tell, but that’s what he said. That is not what my student thought happened in her case, but I noticed the parallel. The pastor whom she succeeded was a placating pastor, and my student is anything but a placater. My student hungers and thirsts after righteousness and justice, and those profound commitments come through unmistakably in her preaching. A comfortable congregation does not want to hear challenges. A comfortable congregation does not want to hear that there are acts they must undertake, that there are positions on which they must take stands, that their journey of faithfulness has not ended thereby bringing them to a place of rest but rather still propels them onward into ever new risks in ever new societal contexts. The world changes so rapidly, and with change comes the demand to understand and then establish the moral standard appropriate for that issue. A hundred years ago, pastors and their congregations had no idea that the day would come when it would fall to them to take a stand against the easy availability of assault weapons because mentally ill people and evil people would be killing innocent and unsuspecting children and adults in places we all once thought safe. That day has come, however, and if we are silent we assist those who increasingly take precious lives. Synagogues, churches, and mosques–my dear friends–are not, if they are true to their calling, spas or salons. The God of Abraham, Jesus, and Mohammad–peace be unto them–calls the faithful together to commission them to stand untiringly for what is right in a world, with plenty of help from the religious right in all three monotheistic communions, constantly trying to baptize evil so that it may be disguised as good. My student has a pastor’s heart, but is unapologetically prophetic–calling the church to mandatory action. As a result, she is under fire by some members of her church, and as an idealist in the best sense of the word that creates an incongruity with which she cannot be at peace. I would hate for any of my successors in churches I have served to find themselves at odds with the congregation because they justifiably called the congregation to action when I had left them comfortable and complacent. Back to Jonah who was doing just that. Jonah, believing that God was geographically challenged, was so determined not to do what he knew good and well he could do that he decided to run from God. He hurries to the harbor and books passage on a cargo boat headed to Tarshish, a city in the opposite direction from Nineveh. Some cartographers have created maps to show the relationship of Tarshish to Nineveh. Nineveh was built on the banks of the Tigris River. Tarshish was as far west from there as Jonah and his people knew anything about. If we try to escape or evade what we were born to do, life will become turbulent. I do not mean that God calls us to do tasks or else–though that is precisely what the book of Jonah teaches. But I do mean that each one of us is born to do some task for which we become rather uniquely qualified, early on probably not even knowing what that is. >June, I think, was born to be a peace activist. That’s as much a part of her personality and her being as anything. >Gordon was probably born to minister to addicts, a job so very few people do well and not for lack of desire. >Marie undoubtedly was born to help people celebrate and mourn through the ministry of hospitality. >Melissa no doubt was born to sing and play music that inspires. >Walt was certainly born to uphold justice. The list could be extended to include everybody in this room. If we resist our calling, by which I mean what we were born to do, life will be turbulent and not because God creates the turbulence to punish us. A fish out of water is going to have a tough time of it. As the boat sailed along toward Tarshish, rather suddenly the calm waters became turbulent, and the ship was tossed to and fro to the extent that professional sailors were scared out of their wits, same as with Jesus disciples as I mentioned earlier. They figured a storm like that had to have been caused by a divine force. Believing in multiple deities, the sailors had no clue which god was behind this and therefore which adherent was the culprit. When in doubt, cast lots. Jonah was the guy. 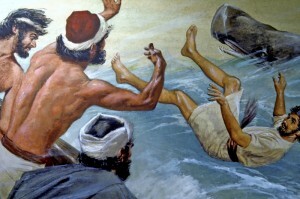 It occurred to some of them that Jonah was a preacher and therefore that he must have some kind of special connection to the God whom he said was the only God. That is not a forgone conclusion, by the way–that those with ministerial kinds of professional responsibilities automatically have a special connection to God. Still the sailors thought if they could get Jonah to appeal to his God that God would still the storm, and all would be well. No. Jonah had this much decency, though. He insisted that they help him toss himself overboard because he said he knew he was the cause of the turbulence threatening to take the lives of everyone on board. Let me remind you again that Jonah is going to come out of this episode okay–physically. A big fish swallows him. In desperation he prays. And as the story was told God upsets the fish’s stomach so that, after three days in its belly, the big fish vomits Jonah out on dry ground. Jonah then reluctantly goes to Nineveh, and begrudgingly proclaims the message that God had told him to preach. What happens there is not a part of today’s sermon, but in brief the people of Nineveh heard Jonah. They took him seriously. They changed their ways and turned to God’s standards, which saved their city from destruction. Jonah was irate; he did not want them saved from destruction. He never got over his anger. That’s what I meant a few minutes ago when I said the book ends in anger, stubbornness, and lack of resolution. I’m not suggesting that in the midst of our turbulence we can get to dry ground if we pray correctly, but I am saying that leaning into love, and God is love, will help us weather the turbulence. Certainly not all turbulence is caused by our failure to live out what we were born to do; that was Jonah’s experience, and it can be our experience. The turbulence can be caused by our own poor choices, but just as often and probably more often the turbulence is caused by forces completely out of our control. Though it is ingrained in the teaching of the book of Jonah and in many parts of Judeo-Christian scripture, I’m saying I do not want you to believe such a thing when tough times come your way, when turbulence comes your way. Don’t ever let yourself think when you are at a low point that some wrongdoing on your part prompted the universe or God to trouble the waters of your life and cause you to fear for your existence. Turbulence comes to the best of us even if we live nearly flawless lives, and the worst thing we can do as we try to get through the turbulence is to blame ourselves for upsetting God. “Preparedness.” I return to that word I used earlier, and I say again: preparedness does not mean paranoia. If I were giving you a how-to list, which is not my intention, the first item on the list would be: Be prepared by knowing that while we can avoid some turbulence through making sensible choices and not destructive ones turbulence is still going to come to us all. The second item on my list if I were making one to share with you would be: Realize that experiencing turbulence of some sort is an unavoidable part of being human; again, it may not last forever, may not do you in, but in time your calm waters are going to get rough. If you know that God hasn’t chosen you for the “unique” experience of life as turbulent sea, somehow that helps. Unfortunately, our tortured central character, Jonah, didn’t know this truth. I well know that there are people in our world who have to deal with turbulence so destructive and so persistent that they die emotionally and even spiritually before they die physically. Those who endure such turbulence without giving up altogether amaze us. It is a fact that we are all in this together. We all have had to/will have to navigate life as stormy sea. The third item on my list IF I were giving you one would be: dare to let others who have been through similar turbulence share your fear, your pain, your anger with you. They more than any well-intentioned person who has not been through what you are enduring have a much better shot at helping you feel understood and supported though the pain or the struggle that may never go away. Thus, support organizations such as Compassionate Friends, one of the groups using our facility from time to time, have come into existence; this is an organization for parents who have lost a child. Same for Alcoholics Anonymous and many other such groups. We read a few minutes ago in the Response words from G. K. Chesterton–the British philosopher, poet, and apologist–who said: “We men and women are all in the same boat, upon a stormy sea. We owe to each other a terrible and tragic loyalty.” Let those compassionate and willing souls who have been through the same troubled waters plaguing you help you face the turbulence. Amen.